This morning Rana Bug was away from the barn at breakfast, so we went to find and feed her. The elephants don’t have to come to the barn, they show up when they choose, and we are more than happy to go deliver their meals. Rana, unlike Maia, doesn’t necessarily come for her food so it can be a bit hard to find her at times. One good thing is her footprints are very distinct because of her issues with her front left elbow. Following her footprints brought us to the creek in the back of the field behind lollipop tree. This is a new area for Rana and, for the first time, she crossed over the stream into the pasture to the North. While it may not seem like a big deal, just 6 weeks ago, Rana didn’t have anywhere to explore. 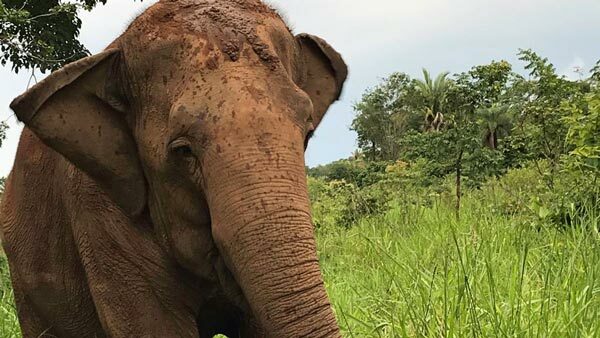 The times she had left her enclosure at the hotel, she always went to the same place and never went for a swim in the pond that she walked past. At lunch, we were discussing that it seems like Rana’s been here for much longer than she has because she is so comfortable and confident. And that’s certainly something worth celebrating. She loves her new home! Thank you very much, sanctuary!!! Yes feel very proud, you should do. It wonderful to see. I very much enjoyed reading the full update about her, and how she responding to treatment and and positive reinforcement too. And getting to know more about her , her need must have been excruciating in her previous life, we know that, but it really brings it home when you see her personality and activities now. So glad Rana Bug is exploring the beautiful vast habitat. Love this sweet girl! Your ticket for the: Celebrating Rana the Explorer!